Take your bike for a drive to celebrate National Motorcycle Week. To any bikers out there: Happy National Motorcycle Week! Cheers to the two-wheeled beasts that provide such roaring thrills and a surge of independence. It’s easy for auto drivers to forget that not everyone on the road has the same level of protection that they do while blitzing around town. Every time a biker hits the road, they face unique safety threats and vehicle drivers are one of the main hazards. According to the MSF (Motorcycle Safety Foundation), more than half of motorcycle crashes involve an auto; the auto driver is to blame for most of those collisions. With such a high statistic, it’s important that drivers educate themselves on how to safely navigate the road with bikers. Here are some practical tips for driving around motorcycles that will keep everyone safer. Motorcylists on the road tend to swerve within their lane. Some drivers might think they’re doing this for fun but, in reality, they do it for one of two good reasons. The first reason is to increase their visibility on the road. The second reason is that they might be trying to avoid the many obstacles in the road. For example, a pothole might be a minor hazard for a car, but for a motorcycle’s thinner wheels and lighter frame, it could be enough to throw the rider from the bike. When driving near a motorcycle, it’s easy to think the motorcycle is farther away than it really is. That’s because it’s a whole lot smaller than a car. Whether leaving your driveway or clearing an intersection, always assume that a motorcycle is closer than it appears to be. The #1 cause of motorcyclist fatalities is when a vehicle turns directly in front of a biker. Before making any turn, thoroughly look around your car. You might easily spot a nearby Corolla beside you, but motorcycles are more challenging to detect. Be particularly aware of nearby bikes when merging onto a road or highway; merging cars must always yield to oncoming traffic. Vehicle drivers who merge without looking are a huge danger to other vehicle drivers, but an even more dangerous threat for motorcyclists who just happen to be driving in the other lane. 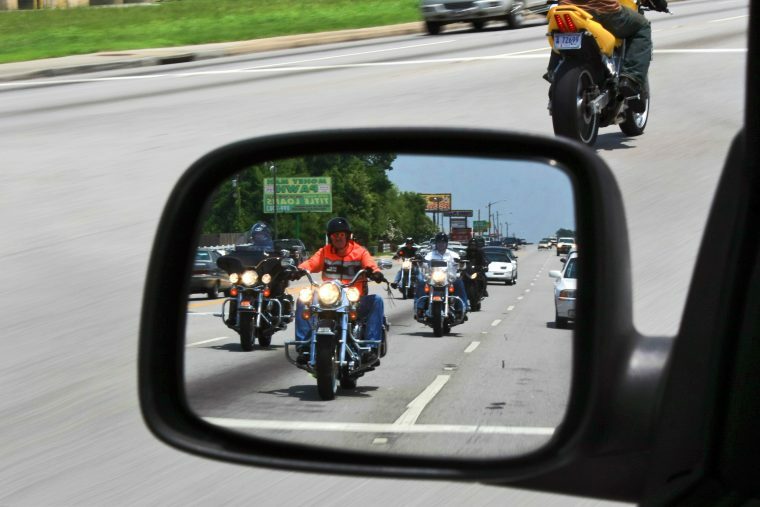 Because motorcycles are thinner and smaller than cars, it’s easy for them to slip into the blind spot area of your vehicle. Don’t just rely on your mirrors—turn your head to get a full view of the area around you before changing lanes. 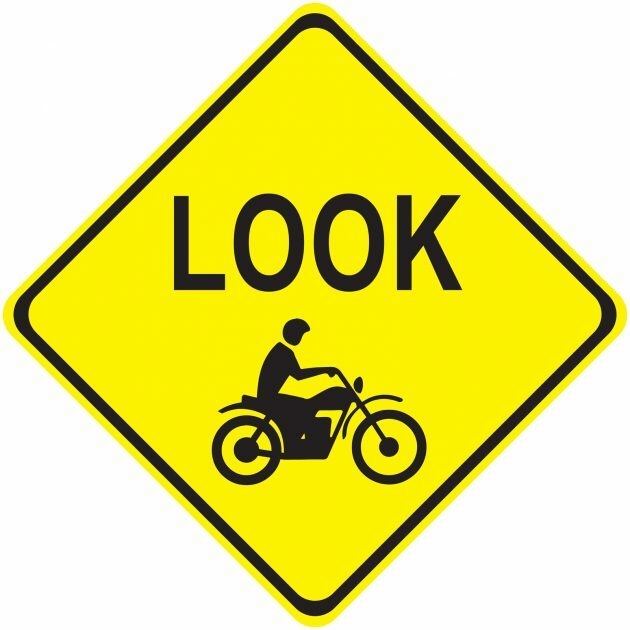 A motorcyclist might be trying to pass you on the side or maybe they’re (dangerously) hanging out in your blind spot without realizing it. We’re all human; sometimes a bikers forgets to put their turn signal on. When motorcyclists stop, the driver traveling behind them might not get a visual warning. For instance, if they downshift or roll off the throttle, the brake light doesn’t kick on. As a car driver, be aware that a motorcycle might slow down at any moment, even if their brake light isn’t on. 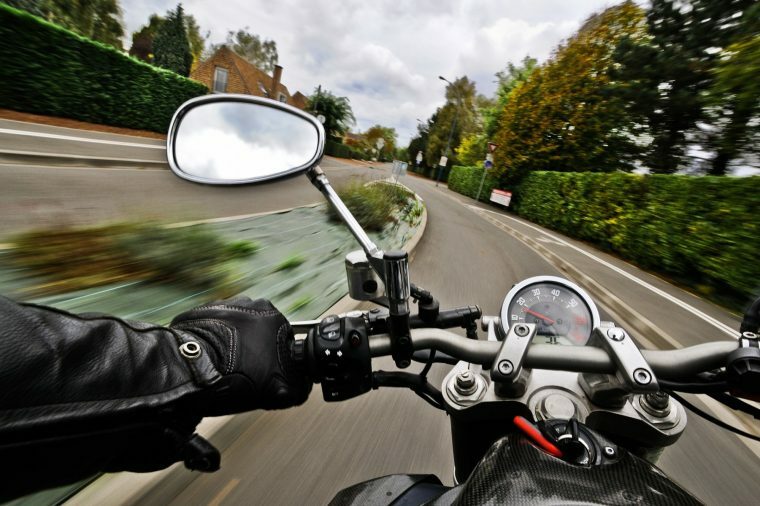 A good rule of thumb is to keep at least 4 seconds’ worth of distance between you and the motorcyclist ahead. The best way to do this is to pick a roadside object like a building or road sign and count the seconds between when the biker passes it and when you pass it. If the weather is inclement, allow even more distance. 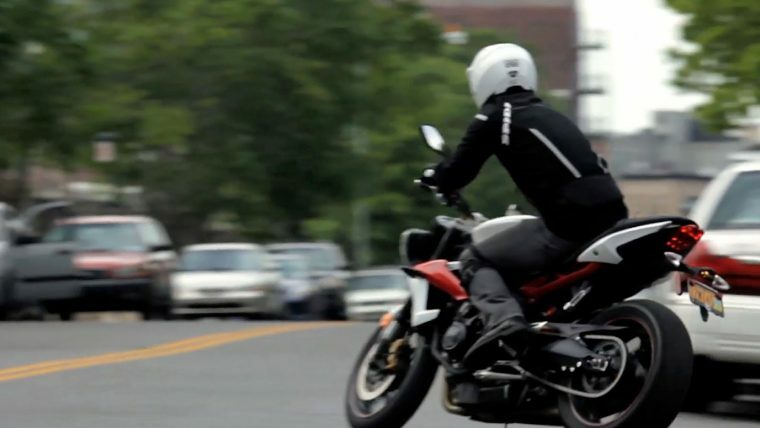 These strategies will equip you to share the road with motorcycles in a safer way.